Join the Quantstamp whitelist now. 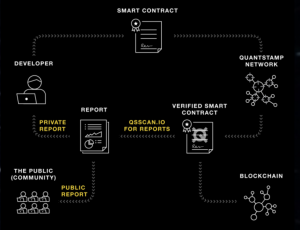 Quantstamp is a protocol for securing smart contracts. They do this by employing what they refer to as scalable proofs-of-audit. This enables them to discover vulnerabilities in Ethereum smart contracts. With the ever-growing field of startups and technologies using smart contracts, this is potentially an exponentially growing market. Their 51-page whitepaper is also very thorough in explaining how they’ll make their vision a reality. It’s worth mentioning that Quantstamp has already completed one security audit – namely for Request Network. There has been a huge amount of hype surrounding Quantstamp. 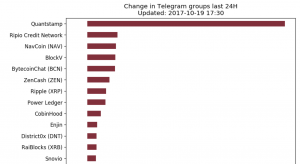 At the time of writing, our Telegram Tracker indicates that they have increased their group size by more than 700 new members in the last 24 hours. One of the reasons for the hype is that they encourage people to submit proofs-of-care to enter the whitelist. This has naturally generated a lot of online content mentioning Quantstamp. The co-founders are CEO Richard Ma and CTO Steven Stewart. The former has a background from finance. The latter from the Canadian Department of National Defense, and from development of smart contracts in general. They also have two very solid Senior Security Engineers in the team with backgrounds from Microsoft, Amazon, and Google. Collectively, the team has more than 500 Google Scholar citations. On the advisor side, they have an impressive list of advisors within engineering, security, blockchain, marketing, and legal. To name a few of them: Evan Cheng is Director of Engineering at Facebook; Dr. Sveinn Valfells is co-founder of Monerium; Dr. Vijay Ganesh is an award-winning researcher at the University of Waterloo. The first thing you should do is sign up to their whitelist. The team will then consider including you in their token sale, based on your contribution in the form of a proof-of-care. Their ICO is certainly not priced very high compared to many other ICOs. Having said that, this is certainly a more niche market than, say, decentralized exchanges, which the likes of Kyber Network and Airswap operate in. In any case, this is certainly an interesting ICO to consider. Register for the whitelist so you don’t miss out!